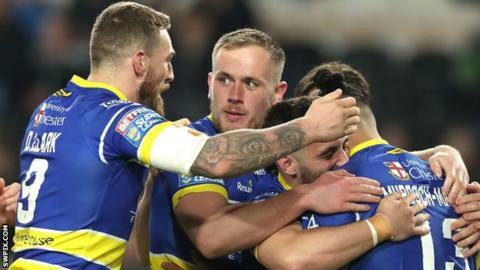 Blake Austin scored four tries and Josh Charnley a hat-trick as Warrington thrashed Hull FC in Super League. Austin ran in a first-half treble, Charnley grabbed two tries in three minutes and Daryl Clark also went over, with Hull's response from Albert Kelly. Wire's 34-6 half-time lead was extended as Austin added his fourth, Charnley scored his third, while Tom Lineham went over twice for the visitors. Ben Murdoch-Masila also scored, with Jordan Lane replying for Hull. The Wire have now won seven of their eight matches this season and are second in the table behind St Helens. Hull were humbled 80-10 in the previous meeting between the two sides last season and although this margin was not as bad, the hosts were ran ragged from the start. Austin, who joined Wire from NRL side Canberra Raiders ahead of the start of the season, stole the show in the first half and had a hat-trick inside 31 minutes. The 28-year-old powered through two tackles to put Wire ahead and Clark quickly followed when he bulldozed over as Warrington scored two tries in the opening 10 minutes. Great work from Chris Hill set up Austin whose dummy enabled him to crash over for a second try, before Charnley slid over in the right-hand corner and scored again three minutes later after Josh Griffin dropped Austin's high kick. Austin doubled his tally for the season with his sixth try of the campaign - and a third of the night - when he powered over, while Hull finally got on the board on the stroke of half-time as Kelly twisted his way over under the posts to reduce the deficit to 28 points at the break. Stefan Ratchford, who scored 18 points with the boot combined with Austin to send Murdoch-Masila over 55 seconds into the second half and Austin's clever dummy enabled him to run-in for his fourth try. Lineham just got the ball down on the line against his former club and Austin was provider again when another dummy enabled Toby King to flick the ball to Charnley for his hat-trick. Danny Houghton and Marc Sneyd combined to send Lane over from close range as Hull scored a second try, but Warrington were in no mood to take their foot off the gas. Lineham ran the full length of the field for his second try and to cap it off, Austin added a drop goal with a minute remaining. "If that's what the top of the tree looks like, we've got an awful lot of work to do. To play a team in that form and that mindset was difficult. "The first set of six defensively set the tone for the whole game. We were second in every department of the sport unfortunately. "We have got 10 backs missing and a heap of forwards missing but I haven't got any excuses. They're red hot and we're down to our bare bones and not at it for some of our blokes tonight." "It was a really disciplined, ruthless 80 minutes. That's been building for a little bit now. "From the first 20 minutes I was really proud of how we played. Hull: Miloudi, Griffin, Tuimavave, Thompson, Faraimo, Kelly, Sneyd, Paea, Houghton, Taylor, S. Manu, Minichiello, Westerman. Replacements: Hadley, Matongo, Lane, Savelio. Warrington: Ratchford, Charnley, Lineham, Mamo, King, Austin, Patton, Hill, D. Clark, Cooper, Currie, Hughes, Philbin. Replacements: Murdoch-Masila, J. Clark, Tasi, Livett.